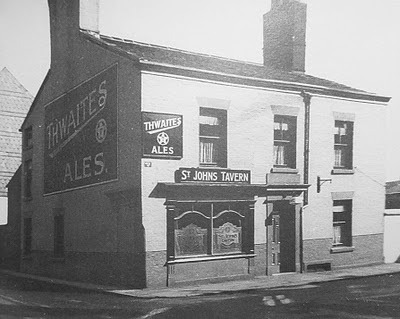 This is St John's Tavern, which stood on the corner of Ainsworth Street and Union Street (its address being 1 Union Street). It was demolished in the early 1960's, as part of the town centre redevelopment. When the markets were built (c1964) a new St John's Tavern was erected and stands to this day, by the spiral staircase, on the corner of the three day market. Note the star logo/symbol and the sloping THWAITES on the advertising boards, both introduced in 1948, when the brewery became known as Thwaites Star Brewery. 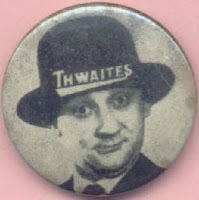 The button badge, also dates from the 1960's and is an image of Freddie 'Parrot Face' Davis, who was obviously involved with some Thwaites promotion, back then.